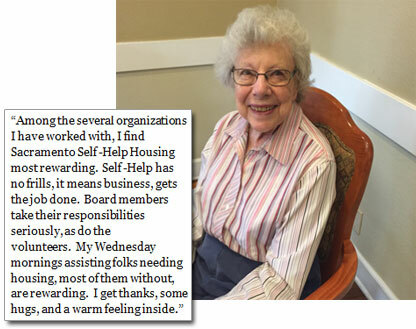 Many of our volunteers have been helping us for years and enjoy a sense of accomplishment. Kay Knepprath is a long-time volunteer. Not only did she serve on our Board of Directors, she continues to help the homeless by volunteering as a housing counselor at Friendship Park. To learn how you can make a difference as a volunteer, contact us at (916)341-0593.